We are currently trying out sippy cups with my 9 month old little man! 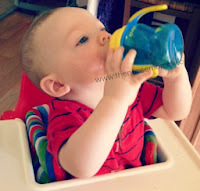 He still receives a bottle for his formula, but he is getting water and juice from a sippy in preparation for him being a year old and cut off from the bottle. 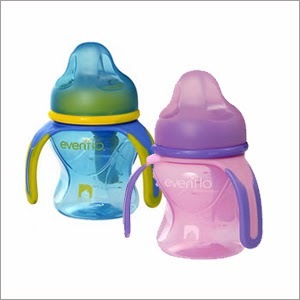 We have tried several styles and recently had the chance to try out the Evenflo Bebek Sippy. Our Thoughts: We love the soft spout because that is all we have introduced him to, to date. I love the three handle system because it takes away from the awkwardness of a baby first trying to use handles on a sippy. This cup is very easy to clean because all parts are removable. There are minimal parts, so not a whole lot to loose. It is affordable, available in a TWO pack for $5.99. It does leak for little man a bit, but he is still in the messy- just trying to learn how to use a sippy stage, so it could be user error. I'd love to win a SureRide™ DLX Convertible Car Seat. I would like their double electric breast pump. I would love to have the Portable BabySuite Premier Playard, Sante Fe Sunset. I really like their Multi-Use Shopping Cart And High Chair Cover; it's a lot nicer than the one i have! I like the Portable BabySuite Select Playard in Galaxy. I would love to have the SureRide™ DLX Convertible Car Seat thanks so much for the chacne to win! I also love the Modern 200 High Chair in Koi. I love the Portable BabySuite® Select Playard Galaxy. I like the FunSip Convenience Cups - Girls!